Amazing product! Worth the money i spent on it. Great phone! Worth the money. - Corning gorilla glass screen protection. - Gets heated up sometimes. One of the best Samsung product I&apos;ve used till now. I&apos;ve been using it for 2 months and literally have no complaints. Best smart phone for businessmen as its processor is pretty fast. 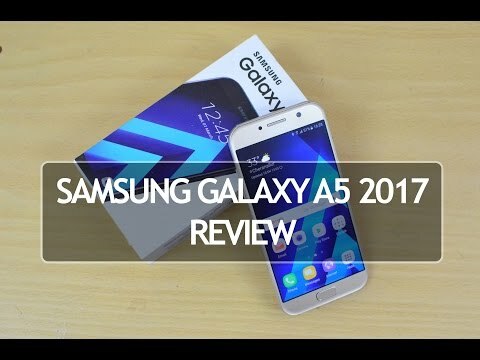 12 Pricebaba users have written their experience with Samsung Galaxy A5 (2017). If you own Samsung Galaxy A5 (2017), please do leave your feedback too. Lowest price of Samsung Galaxy A5 (2017) price in India starts at Rs. 22,400 Samsung Galaxy A5 (2017) is available on Flipkart at Rs. 22,400. Prices updated on 20th April 2019. Samsung Galaxy A5 (2017) is a dual SIM device that was launched in February 2017. Impressive look, fingerprint sensor, a good camera, a mini jack port at the right bottom, side mounted speakers, metal and glass construction, a micro USB, smooth curves on the edge and huge storage are its major highlights. Samsung Galaxy A5 (2017) comes with 5.2 inch AMOLED IPS LCD display, 1920 x 1080 pixels resolution, 401PPI pixel density. It has a dimension of 145 x 71 x 7.8 mm. The main body is made of glass whereas the accents are metallic. It has a capacitive screen with multi touch facility and 16M colours. This dual SIM device is loaded with 1.9 GHz Samsung Exynos 7 octa-core processor, 3GB RAM, Mali-T830 graphics and Android 6.0 Marshmallow operating system. Light sensor, proximity sensor are inbuilt. Turn-by-turn navigation and voice navigation are available. Samsung Galaxy A5 (2017) is built with a 16MP rear camera. It has an internal storage of 32GB that can be expanded up to 128GB by using a micro SD card. This dual SIM device is loaded with non-removable 3000mAh Li-ion battery. Users can enjoy connectivity via 4G LTE (India Compatible), 3G, 2G, Wi-Fi, Bluetooth, GPS with A-GPS and GLONASS, NFC and VoLTE (Works with Jio). Both the single SIM card and the dual-SIM card models are available. Samsung Galaxy A5 (2017) faces competition from Moto X Force, OnePlus 3 and Apple iPhone SE. Samsung Galaxy A5 (2017) has a bigger screen than Apple iPhone SE whereas it has a smaller screen than Moto X Force and OnePlus 3. Ans: It features a 16MP camera for crisp clear images. It also performs well in low light conditions.